The Gulf of Maine as a whole is influenced by the Labrador Current, which carries relatively low-salinity water from the Arctic and the St. Lawrence River. The Labrador Current flows southward off Nova Scotia and then into the Gulf of Maine, bringing poorly buffered waters to the Maine Coastal Current and contributing to coastal acidification. Red, orange, and yellow on this map indicate areas that tend to have corrosive conditions, such as near the mouths of the Penobscot River and Kennebec River. These areas are influenced by freshwater that enters the ocean from land, carrying excess nutrients that lead to coastal acidification. 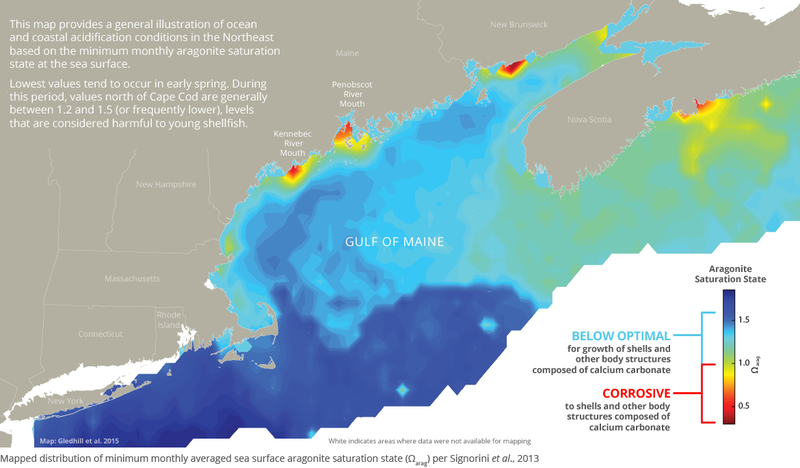 For more information about regional conditions, see the report "Ocean and coastal acidification off New England and Nova Scotia".